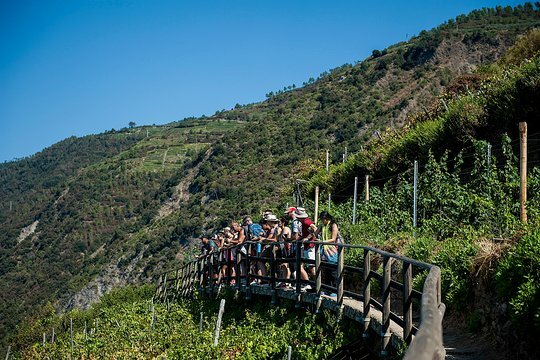 Led by our knowledgeable guides, trek scenic, ancient trails, wander up through the terraced wineyards and olive groves, all along the spectacular coastline of the true Italian Riviera. 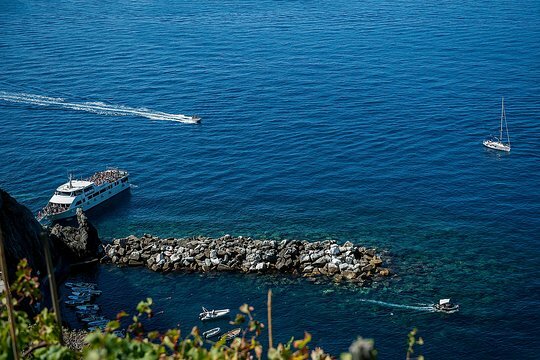 At the cliff top village of Corniglia, after the panoramic walk you have free time to relax and take-in the perfect view of the sea and surrounding hillside. 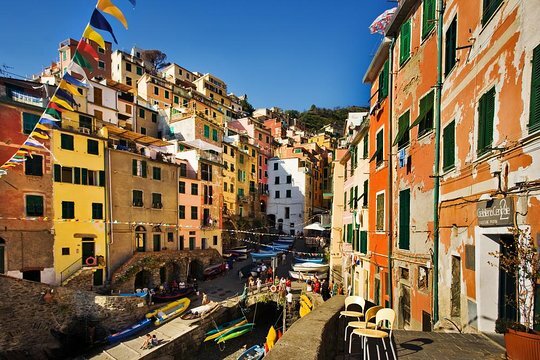 After Corniglia, we continue our tour towards the village of Vernazza, one of the prettiest and most characteristic of the towns. Here we have free time to sit in one of the cheerful bars and cafés, or even have a cooling swim in the sea. 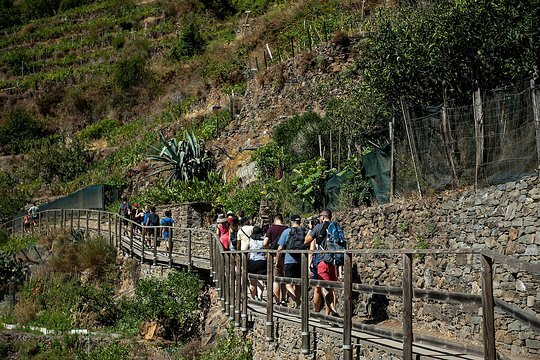 Please note: Due to a landslide which occurred at the end of September 2012,the famous path “Via dell’Amore” has been closed. Took this tour with my husband, son, daughter-in-law and grown grandchildren. The hike was very challenging as it rained a bit and the path was slippery in many spots. The hike moves VERY quickly and is actually a little dangerous as there are no guardrails in most spots and so you find yourself with your head down forging ahead and trying not to trip and fall. If there were another half hour or hour allotted you would be able to at least rest and have time to at least enjoy the views. This is already a 12 hour day trip so probably no practical. Bathroom stops are infrequent so plan accordingly. Highlight of our Italy trip, Alessandro was great at keeping everyone together and recommending things to do when we had free time. A must in my opinion, the views you see while hiking are amazing. Do wear sneakers as the hike can be rocky at times. Book via walk about tours (the company website) as they’re prices are much less!!!! This fabulous tour took us to all five villages with time to explore each. Our guides, Gloria and Sarah were phenomenal! They began our tour in Manarola, the second village, to avoid the crowds, which was great! Travelled by small local trains between villages in 4-10 minutes. Hiked to Corniglia for a sumptuous lunch at Cecio, then on to Vernazza and Monterrosa. Anyone who opted not to hike had an hour longer in each of the last two towns to shop, eat gelato or swim in the sea. We then took a boat Riomaggiore which went close enough to each village to get great photos in the late afternoon sunlight - a photographer's dream! The two hour trip over was filled with interesting facts about the town's through which we traveled, so it went quickly. Highly recommend this company. They treat you right! I highly recommend using Walkabout Tours for your hiking trip from Florence to Cinque Terre. Our tour guides, Olivia and Martina, were knowledgable, funny and engaging. They could not have been better suited for the job. Our bus driver, Giancarlo, was the most skilled driver I've ever seen. He drove the bus around tight, mountainous curves with the precision of a surgeon! The hike was a REAL hike! Alhough doable, I would not recommmend for the faint at heart or those terribly out of shape. I'm not athlete nor am I a tiny woman but I exercise regularly, and it was tough! We shared trails made for two with fellow hikers walking in the opposite direction, with nothing more to hold on to but a banch here or there. We opted for the $15 lunch at the bottom of the trail. It was a good option after the crazy hike. The views were great and food good. The remainder of the day still required walking but it was on much flatter terrain. The weather was great, so we managed to see all five villages and take the ferry ride. All in all, its a long, exhausting day, worth every dollar that it cost and every bruise aquired along the way! UNFORGETTABLE DAY AND STEFANO AND DUNA WERE THE ICE ON THE CAKE! This experience is amazing! 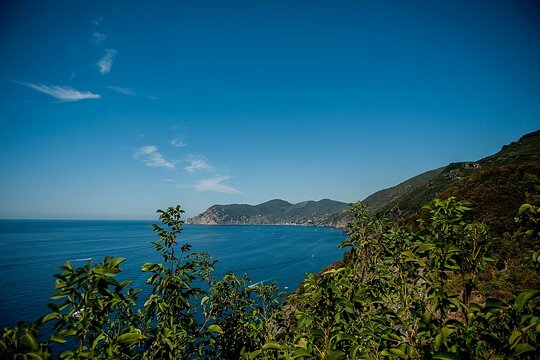 In just one day you have the opportunity to visit 5 incredible Italian villages, stay in touch with nature walking in paths with breathtaking views and relax yourself on the beach. What’s more we have had the luck to be accompanied by Stefano and Duna. What can I say about them? They were literally perfect! They’re so easygoing, sunny and super organised people. While we were on the bus and during the whole day, they kept on explaining us interesting facts about what we were visiting. They made everyone feel at ease. At the end of the trip we were all friends! I truly recommend this excursion and I hope you’ll have the luck to be with Stefano and Duna who were the ice on the cake! I couldn’t have spent a better day!! It has been an unforgettable day discovering the beauty of 5 Terre. The best part of?! Surely the tour leaders STEFANO and DUNA!! They’ve been so nice and friendly with us! They love their job and we could notice it!! Good job guys! DUNA AND DARIO made the entire trip for us!!! The best day we’ve had in Italy and we have been here over a week. It was so incredible because of the energetic, kind, knowledgeable, personable and helpful guides Duna and Dario. They singlehandedly made the trip what it was. We have done lots of guided tours across Europe, and they are by far the best guides we have had! Overall a phenomenal day!! We had the most fantastic day with Stefarno and Duna .The walk started off easy but due to extremly heavy downpour of rain soon became very slippery and in places dangerous.Our group was with Stefarno who was brilliant together with fellow walkers in guiding us down safely . Although soaked to the skin - literally - we had the most fantastic time and can highly recommend the walk but do take the advice with regarding wearing the correct foot wear in case of rain as the path can become a river and make it somewhat difficult to master in normal trainers. We did suggest that the" Walkabout " company would do well if they had some t-shirts with their slogan on for walkers to bye should they, like us become soaked ! A fantastic day out and we would not have missed it for anything.